The annual meeting of the German Society for Bipolar Disorder (DGBS) is taking place from the 6th to the 8th of September in Hamburg. This conference brings together patients, relatives of patients and scientist associated with Bipolar Disorder. Dominik will not only attend there for fruitful discussions and learn more about the human side of Bipolar Disorder. He has the great honor to give a talk about animal models for Bipolar Disorder, focusing on his recently published article animal models for bipolar disorders: from bedside to the cage. The talk will take place in the session “recent findings from research” together with the winner of last year Jules-Angst research award of the DGBS Dr. Sarah Kittel-Schneider. Feel free to join if you are interested! From the 05th until the 11th of September Nadja will be part of the Evolution of the brain Summer School at the Hokkaido University (Sapporo, Japan). 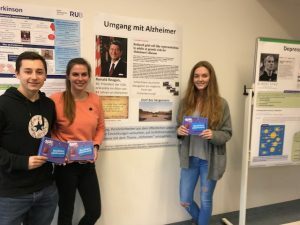 Organized by leading scientists from the Hokkaido University and the Ruhr-University Bochum the summer school aims to teach young neuroscientist in their early career about various subjects of comparative neuroscience and brain evolution. In her talk, Nadja will give an overview of emotion across different animal species. Besides interesting talks around the topic of comparative neuroscience and brain evolution, the summer school moreover, provides practical lab sessions, in which participants can learn state of the art techniques, a project planning workshop and more! More information can be found here. 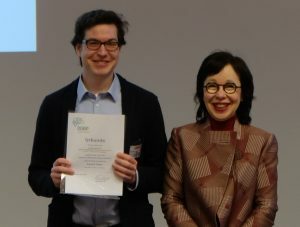 At the recent FENS Forum in Berlin, we proudly presented current findings of our research. The posters ranged from cell culture approaches (Marie) to an animal model of bipolar disorder (Dominik), consequences of early life stress (Anna) and a new application for an improved two-bottle-preference task investigation (Jenny). We were pleased about the huge interest in our work and the fruitful discussions at the meeting!